Streamy, which we wrote about last week, is sending out early beta invitations and I had a chance to be one of the first people to poke around on the site. The video we included in that post still shows a very current user interface, and the feel of the product is very close to what is shown there. 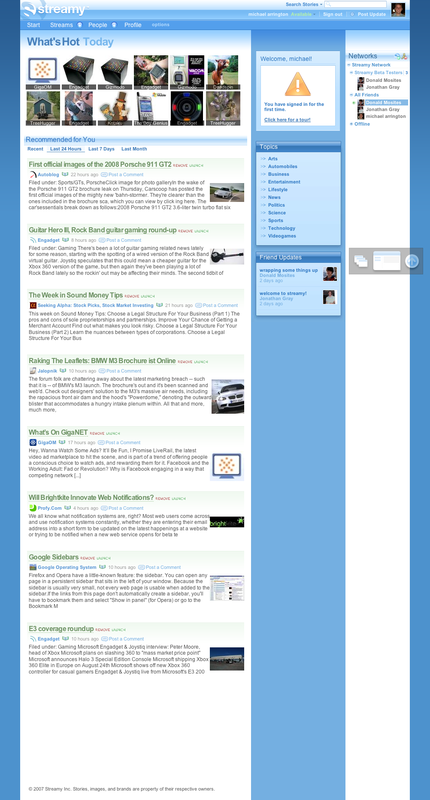 Or click on the image to the right for a very large screen shot of the home page. 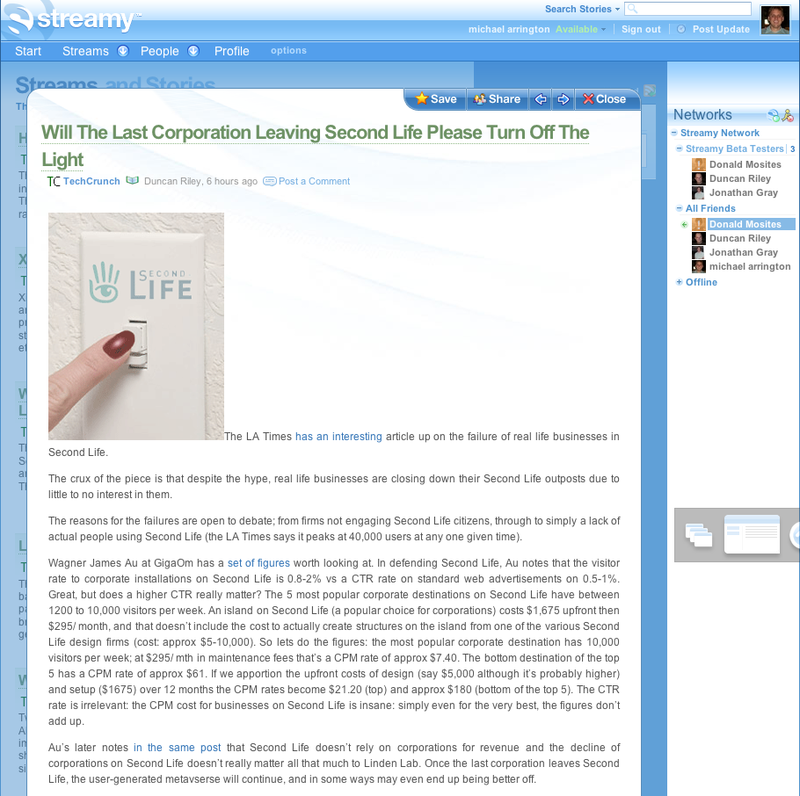 Streamy takes features from many new web startups, but it is not a competitor to Digg. No voting to drive stories to the top, for example. It’s a personalized news service and social network. Digg isn’t personalized. It’s news for the masses based on popular opinion. At its core, this is a social network, where adding friends is the first order of business. Once you have friends, you can share news items with them, and get recommendations from them via email or a built in, Meebo-like instant messaging service. You also need to build out your profile. Do this by adding a picture and personal information, joining groups, adding feed subscriptions, etc. 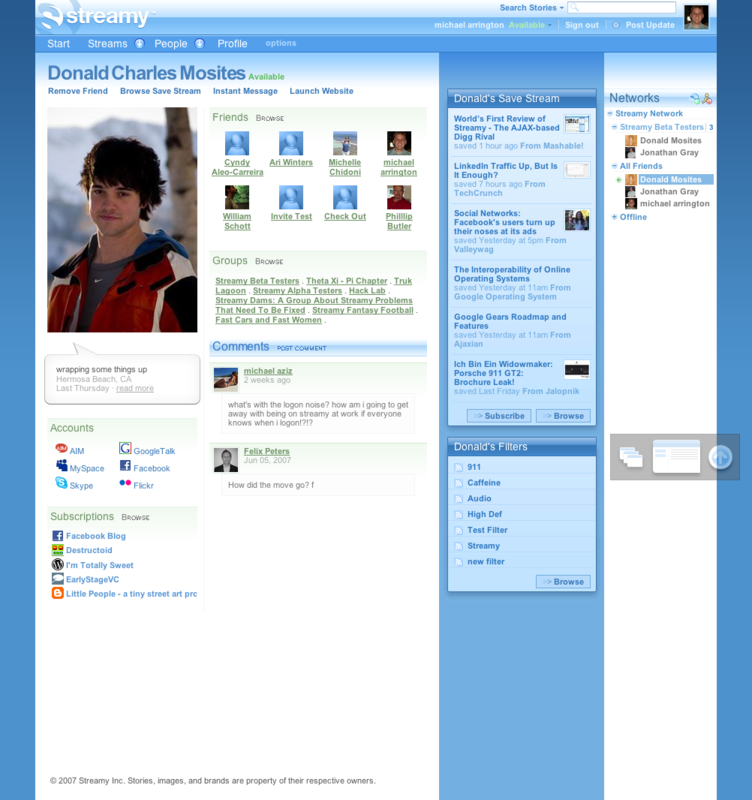 A screen shot of co-founder Donald Mosites’ profile is here. But Streamy is all about the news, and the social network is there to spread the good stuff. Like many who’ve tried and failed (see the discussion under “Mgnet” on this post), Streamy is offering a personalized news service. News items shown to you on the home page are based on it’s idea of what you will like. It takes into account the types of news feeds you subscribe to, what you are commenting on, and what your friends are reading. Above the recommendations, though, are the top stories. This is the only place where Streamy will compete with Digg, in pushing popular stuff to the masses. The stories are image-driven (see top of first screen shot above). AOL also went this way with their new Mgnet product after a lot of user testing – people like pictures, apparently. Each news item can be commented (very similar to what Newsvine is doing), emailed, or dragged into an IM conversation. Users can also set up topic-based filters to drill down to stuff they really want to see. I’m sticking to my initial opinion of Streamy (“It is well designed, has lots of intelligent features, and is almost sure to drop into obscurity immediately after launch.”). It’s pretty and extremely well thought-out, but it’s not clear that it does anything new enough to grab people’s attention. There is, however, one feature that’s pure brilliance…the built in instant messaging feature already integrates with AIM, so you can see your AIM buddies on Streamy and send them stuff from the site. In the next few days they say they’ll be adding support for Live Messenger, Yahoo and GTalk as well, which gives it most of the functionality of Meebo. Users will have the ability to quickly spread news items to their friends right on the site, and this is a very viral feature. I do have one complaint – the site makes a lot of noises, similar to I’mInLikeWithYou, and there is no obvious way to turn it off without muting the speakers. Not good for use at work. Streamy is based in Hermosa Beach, CA (Los Angeles). They raised $100,000 in May 2007 from Driftwood Investments.